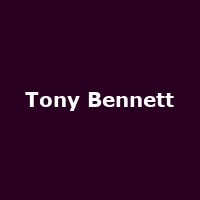 An entertainer and singer of Tony Bennett's stature really needs little introduction, perhaps just one or two reminders as to why he is held in such high affection by music lovers around the world. Born in Queens in 1926, Bennett has risen to become one of the world's best-loved (and so-called) crooners. In 2012, and soon to turn 85, Bennett is a favourite armchair of a music experience; a little worn in places but still a warm and welcome embrace on cold days. His silky smooth voice has charged many a classic from the American songbook with the bright optimism of a summer morning. He's left his heart in San Francisco, stepped out with his baby, recorded a duet with Lady Gaga and lived to tell the tale. In fact, arguably, he's in better shape than ever. Fresh from his 2011 No 1 album Duets II, the most recent of his 60 or so records which included high profile duets with Gaga, Amy Winehouse (a collaboration which won a Grammy), Aretha Franklin and Mariah Carey, the New Yorker is again visiting the UK with a clutch of summer dates. Tony Bennett will begin his leisurely cruise around the nation at the Symphony Hall in Birmingham on 24th June, followed by dates in Glasgow and Liverpool, before two nights at the Royal Albert Hall on 30th June and 1st July 2012. The final date is at Manchester's Palace Theatre on Tuesday 3rd July. We will have tickets available for most shows when they go on sale at 9am on Friday 8th March, priced from around £55. The Manchester date is already on sale, priced £46 to £66. Befitting a giant of the entertainment world, these tickets are, despite their comparatively hefty prices, expected to sell out and quickly. So get 'em booked.